If you're looking for an album of straight-forward and humble yet shiny songs, check out Ten Story Loves' self titled release. Listen a bit more carefully and you may notice traces of early 70s arena rock, late 80s power-pop as well as a touch of country. 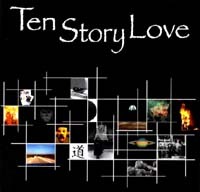 They may be the epitome of a do-it-yourself band, but Ten Story Love gives the tag a good name. The digital sound and production quality is top quality. Brad Page (guitars & vocals), Scott Gibbs (guitars & vocals), and Michael Haught (bass) enlisted the talents of former industrial drummer Jason Waugaman. Waugaman's playing alone makes the album worth checking out.